This week we've been looking at another couple of gorgeous children's books from Lonely Planet. City Trails is a brand new series which launches this month and includes London, New York and Paris. We are regular visitors to London and always keen to find new and interesting places to visit, so City Trails - London (affiliate link) is perfect for us. Young readers can learn about these amazing cities and discover 19 themed trails which pick out things to see and do around the city. There are stories, fantastic facts, photos and illustrations, covering a huge range of attractions. Harry has been poring over the book and picking out the things that he wants to see next time we are there, even though we feel like we know the city pretty well there are still many things that we've not yet discovered! Spot the Lot is a brilliant new title that is part sketch book and part I Spy book. Spot The Lot (affiliate link) is packed with pages covering a huge variety of places that you might visit when out and about, from exotic destinations like the ski slopes and on the aeroplane, to more everyday places like the shops and the park. All the things that you might see there are given points depending on how rare they are, and if you don't see them while you are there you can spot them in the illustration on the next page. There is also a page for your own drawings relevant to the location. 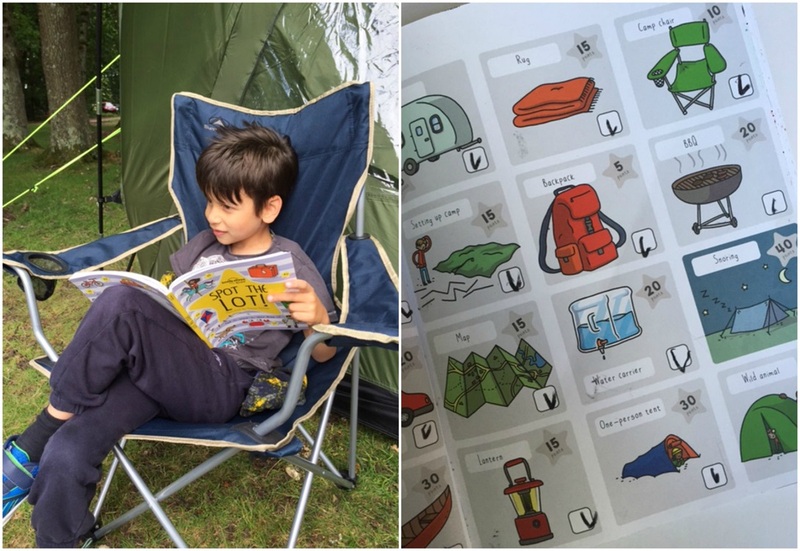 We first took this book out on a recent camping trip, and the children had a great time spotting things together while we set the tent up and then colouring in the next page. Then we've also been using it at home for sketching and colouring. It's a lovely little book and will be accompanying us on many of our adventures! We received copies of these books to review. Amazon links are affiliate.